The aim of this game is to predict the possibility of colors (Red or Black), specific numbers or number combinations that the ball will fall into. There are 37 numbers on the Prevision Roulette table available for betting, there are three numbers in each row and 12 numbers in each column. Half of the numbers are in red and the other half are in black with the exception of "0"(Zero) where it is independantly marked as green in color. 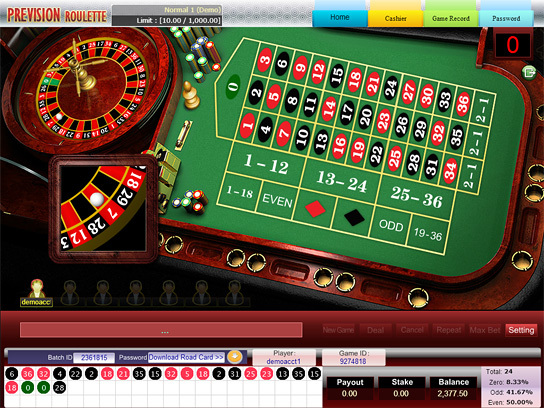 Players can carry out many different types of Prevision Roulette bets, mainly divided into "Inside Bets" and "Outside Bets". Inside Bets are bets on individual numbers or bets on the division lines between numbers; and Outside Bets are bets on other areas. There are many different betting options available, including: Straight up, Split, Street, Corner, Six-line, Dozen, Column, Red or Black, Odd or Even and High or Low. Generally, Prevision Roulette does not limit the number of bets placed as long as it is within the contraint of the table limit.